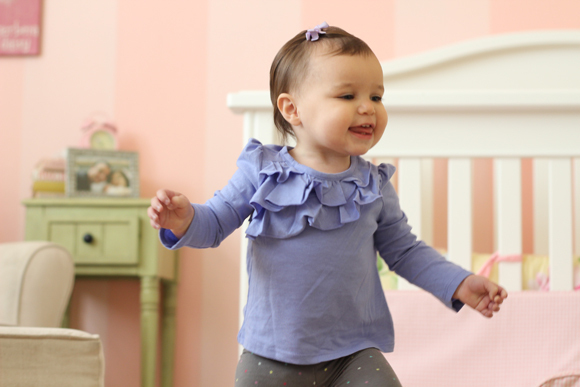 Born Friedman » Fifteen Months! Our little not-so-little, on-the-cusp-of-her-Bat-Mitzvah, basically-an-AARP subscriber baby is 15 months today and I can’t believe how fast time flies. I literally can’t keep up (as evidenced by the silence on BornFriedman) and have lots to share and will unravel some stories in the coming days! 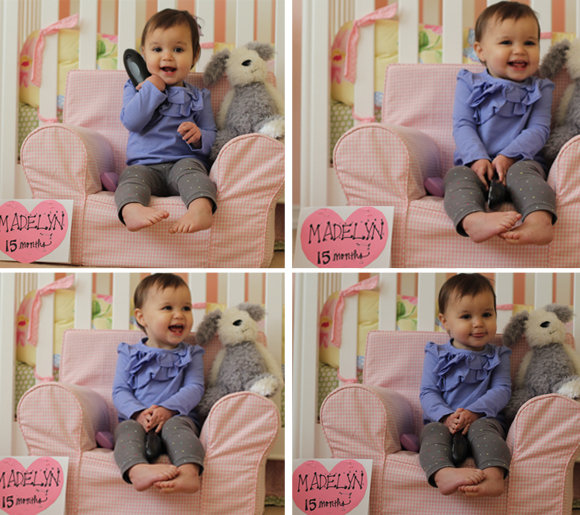 But for now, we celebrate 15 months of Madelyn. She has definitely gone from baby to little girl status. She’s longer, leaner, and the hair — oh the hair! It’s finally growing like a weed and the curls are taking shape. This is going to be fun! Has about 10 teeth. Her molars are almost finished cutting through and if I had my act together, I’d have created Splash Zone signs for her to carry around her body. Anyone who gets near her is bound to get wet. She’s pretty juicy with the drooling, so I’m pretty much over the teething just for that reason alone! Thankfully, she’s not a terrible teether. She doesn’t complain much and she acts pretty normal. No fevers, no weird poops. Just drool. Like, she basically makes a basset hound look as dry as a raisin. Knows parts of her face! Ask her where her ears are. She’ll be glad to slap them with her hand. Ask her where her head is. She’ll pat it enthusiastically. Ask her where her eyes are. She’ll blink really slow and with determination. Ask her where her mouth is. She usually makes politically incorrect Native American tribal sounds. We’re still working on the nose. She still dones’t know nose. I’m sure her Poppa will have a dirty way to teach her that one. Ahem. Enjoys throwing food. Please tell me this is a stage. My dog is going to become obese and my housekeepers are going to become very rich because I seem to be calling them more and more. So, win-win for everyone except mommy. As soon as she starts to throw her food, we take it away, remove her from the high chair, and tell her that eating time is over. We don’t make a big deal, but we don’t ignore this behavior entirely either. However, the absolute lack of remorse and apathy she shows about this consequence makes me very, very, very fearful of her years to come. When does the food throwing stop? Any pieces of advice to share? And why does she not want to eat delicious food that I wish I could eat, but can’t because she made me fat? Oh, the irony! She just keeps on keepin’ on.